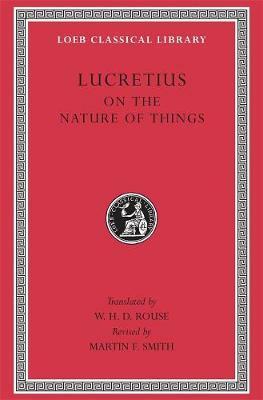 Lucretius (Titus Lucretius Carus) lived ca. 99-ca. 55 BCE, but the details of his career are unknown. He is the author of the great didactic poem in hexameters, De Rerum Natura (On the Nature of Things). In six books compounded of solid reasoning, brilliant imagination, and noble poetry, he expounds the scientific theories of the Greek philosopher Epicurus, with the aim of dispelling fear of the gods and fear of death and so enabling man to attain peace of mind and happiness. In Book 1 he establishes the general principles of the atomic system, refutes the views of rival physicists, and proves the infinity of the universe and of its two ultimate constituents, matter and void. In Book 2 he explains atomic movement, the variety of atomic shapes, and argues that the atoms lack colour, sensation, and other secondary qualities. In Book 3 he expounds the nature and composition of mind and spirit, proves their mortality, and argues that there is nothing to fear in death. Book 4 explains the nature of sensation and thought, and ends with an impressive account of sexual love. Book 5 describes the nature and formation of our world, astronomical phenomena, the beginnings of life on earth, and the development of civilization. In Book 6 the poet explains various atmospheric and terrestrial phenomena, including thunder, lightning, earthquakes, volcanoes, the magnet, and plagues. The work is distinguished by the fervour and poetry of the author. William Henry Denham Rouse (1863-1950) was Headmaster of the Perse School and a founding editor of the Loeb Classical Library. Martin Ferguson Smith is Emeritus Professor of Classics, Durham University, UK.